South Korea's LG U + officially launched its LTE-Advanced service, promising download speeds of 75 Mbps to 150 Mbps -- roughly twice the performance of its standard LTE service. The LTE-A network is using carrier aggregation of 800 MHz and 2.1 GHz spectrum. Compatible handset initially include a version of the Samsung Galaxy S4 and soon the LG Electornics Optimus G2. By the end of the year, the company expects there will be six LTE-A terminal devices on the market. LG U+ said its network will offer pure LTE connectivity between compatible handsets, where voice is carried by VoLTE rather than falling back to CDMA. LTE-A is initially available in Seoul / Manila / Gwangju, Daejeon and other major cities. LG U+ vendors include LG, Ericsson, Nokia Siemens Networks and Samsung. In late June 2013, SK Telecom launched the world's first LTE-Advanced (LTE-A) service through smartphones. The LTE-A service offers download speeds of up to 150 Mbps, which is two times faster than its regular LTE service, and 10 times faster than its 3G network. LTE-A coverage initially is available in Seoul and central city areas of Gyeongg-do and Chungcheong-do. Expansion to 84 cities nationwide is planned. At top speed, LTE-A users can download an 800MB movie in just 43 seconds. The LTE-A implementation leverages several advanced mobile network technologies including Carrier Aggregation (CA) and Coordinated Multi Point (CoMP). SK Telecom plans to implement Enhanced Inter-Cell Interference Coordination (eICIC) in 2014. 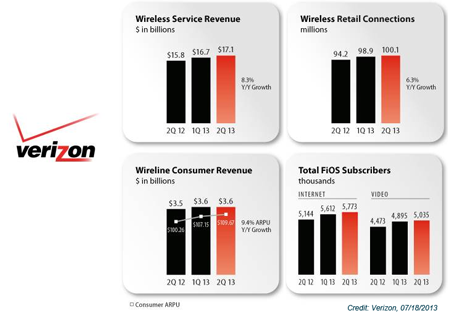 Verizon reported Q2 2013 operating revenues of $29.8 billion, up 4.3 percent year-over-year, while operating income increased 16.0 percent, to $6.6 billion, compared with $5.7 billion in second-quarter 2012. Cash flow totaled $17.1 billion in first-half 2013, compared with $15.3 billion in first-half 2012. Capital expenditures in first-half 2013 were $7.6 billion, compared with $7.4 billion in first-half 2012. Verizon is increasing its capital spending guidance from $16.2 billion to between $16.4 billion and $16.6 billion for full-year 2013. The company said it anticipates higher demand for wireless data consumption as it begins deployment of AWS (advanced wireless services) spectrum in second-half 2013. Total revenues were $20.0 billion in second-quarter 2013, up 7.5 percent year over year. Service revenues in the quarter totaled $17.1 billion, up 8.3 percent year over year. Retail service revenues grew 7.8 percent year over year, to $16.4 billion. Verizon Wireless added 941,000 retail postpaid net connections, out of a total 1.0 million net retail connections, in the second quarter. These additions exclude acquisitions and adjustments. Verizon expects to continue to see increases in quarterly sequential net additions for retail postpaid connections in the second half of 2013. At the end of the second quarter, the company had 100.1 million retail connections, a 6.3 percent increase year over year -- including 94.3 million retail postpaid connections. Smartphones accounted for 64% of the retail postpaid customer base at the end of Q2 - up from 61% at the of Q1. Consumer revenues were $3.6 billion, an increase of 4.7 percent compared with second-quarter 2012. Consumer ARPU for wireline services increased to $109.67 in second-quarter 2013, up 9.4 percent compared with second-quarter 2012. FiOS revenues grew 14.7 percent, to $2.7 billion in second-quarter 2013, compared with $2.4 billion in second-quarter 2012. ARPU for FiOS customers continued to be more than $150 in second-quarter 2013. Verizon added 161,000 net new FiOS Internet connections and 140,000 net new FiOS Video connections in second-quarter 2013. Verizon had a total of 5.8 million FiOS Internet and 5.0 million FiOS Video connections at the end of the quarter, representing year-over-year increases of 12.2 percent and 12.6 percent, respectively. Broadband connections totaled 8.9 million at the end of second-quarter 2013, a 1.9 percent year-over-year increase. Overall, net broadband customers increased 45,000 in the second quarter, as FiOS Internet net customer additions more than offset a decline in subscribers for DSL-based High Speed Internet services. Verizon has been replacing high-maintenance portions of its residential copper network with fiber optics to provide enhanced services and to reduce ongoing repair costs. In first-half 2013, Verizon migrated 169,000 homes to fiber, toward a target of 300,000 migrations within FiOS markets in 2013. Ericsson reported Q2 sales of SEK 55.3 billion, flat compared to last year, as operating income fell to SEK 2.5 billion, down 24% compared to last year. Sales for comparable units, adjusted for FX, grew 7%. Reported sales were flat YoY, due to continued currency headwind,” said Hans Vestberg, President and CEO of Ericsson. "There was continued high project activity in Europe as well as in North America where two large mobile broadband coverage projects have peaked in first half 2013. North East Asia had another challenging quarter following continued structural decline in GSM investments in China, FX in Japan and lower business activity in South Korea due to spectrum delays." Networks sales increased 1% YoY, with strong growth in North America and Latin America as well as Western and Central Europe, while sales continued to decline in North East Asia. 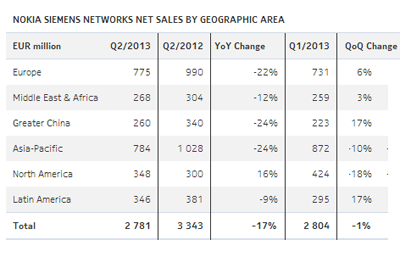 Networks sales were flat QoQ, with strong sales in Latin America. CDMA sales continued to decline rapidly both YoY and QoQ. The structural decline in GSM sales in China and in CDMA sales in North America continued as anticipated. CDMA sales declined by -54% YoY and -31% QoQ to SEK 0.9 b. 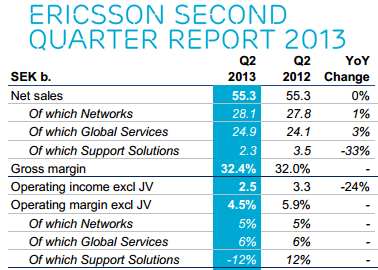 Global Services grew 3% YoY, driven by continued high activity in Network Rollout. Professional Services sales declined -1% YoY, negatively impacted by FX effects. Sequentially, Global Services grew by 16% and Professional Services grew by 15%. Servicesrelated sales in North America were strong in the quarter. The number of subscribers served by networks managed by Ericsson has passed the 1 billion threshold. Nokia Siemens Networks achieved underlying profitability for the fifth consecutive quarter, with a Q2 non-IFRS operating margin of 11.8%, reflecting record non-IFRS gross margin and continued progress relative to its strategy. Nokia said the performance exceeded the earlier expectation for Nokia Siemens Networks non-IFRS operating margin to be approximately 5%, plus or minus four percentage points. NSN's Q2 net sales decreased 1% quarter-on-quarter to EUR 2.8 billion, partially due to a divestments of businesses not consistent with Nokia Siemens Networks strategic focus, as well as the exiting of certain customer contracts and countries. Excluding these two factors, Nokia Siemens Networks net sales in the second quarter 2013 declined by approximately 11% due to reduced wireless infrastructure deployment activity, which affected both Mobile Broadband and Global Services. EdgeCast Networks announced $54 million in new financing for its content delivery network. The company said it has added more than 2,000 accounts in the past year and now has more than 6,000 accounts, including such well-know brands as Twitter, Pinterest, Sony, and Hulu. Its network includes more than 30 POPs in the major data centers where primary carriers exchange traffic. "Millions of people use EdgeCast every day – when they use Twitter, Pinterest, Tumblr, Hulu, or any other of the thousands of sites we accelerate worldwide. We deliver more than 4 trillion digital items a month to almost every Internet user in the world,” said Alex Kazerani, EdgeCast Chairman and CEO. “We are proud that our investment partners recognize our incredible performance and share our enthusiasm about our continued growth." The Series D funding round was led by Performance Equity Management (PEM), with follow-on participation from the company’s existing investors Menlo Ventures and Steamboat Ventures. The equity portion of the financing was augmented with a debt facility from Silicon Valley Bank. Telx opened its third data center in New York Cit at 32 Avenue of the Americas (6th Ave). NYC3’s (32 Avenue of the Americas) Interconnection Center covers an initial 72,000sf with additional opportunity for growth.The facility will leverage Telx’s dense connectivity environments at both NYC1 (60 Hudson) and NYC2 (111 8th Ave) offering the collective Telx customer base access to over 600+ network alternatives. In addition, Telx confirmed that the Rudin Family has chosen Telx as a long term strategic partner to exclusively manage and operate the HUB, the carrier-neutral meet me room at 32 Avenue of the Americas. The HUB which aggregates voice, data and wireless service providers in a single network dense facility. Telx will assume exclusive operation of the HUB and will develop a new 10th floor data center with the opportunity for expansion onto multiple additional floors in the building. Telx now operates a total of 6 within the greater NY/NJ metro area encompassing over 550,000 gross square feet.